The 17 ASHEVlLLE class Patrol Gunboats were built during the late 1960's for use in the coastal waterways and the Mekong Delta of Vietnam, to help stem the flow of communist reinforcements and supplies coming from the north by inshore water transport. 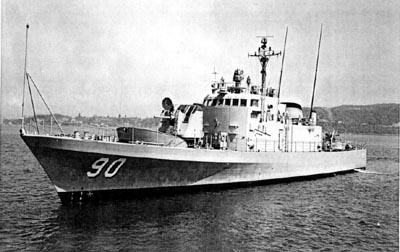 These 166 foot vessels were the first class of US Navy patrol craft to be powered by a combined diesel engine for cruising and a gas turbine engine for high speed maneuvers (CODAG). Although the US Navy did not utilize these vessels very well after the end of the Vietnam war, several other navies that received them are still using them today. In the late 1970's a couple of these ships were fitted with a box launcher for a Tarter missile and its control system. Special Shipping: This hull can be shipped via FEDEX Ground Service as in OS-1 size package. Shipping and handling in the USA 48 states is $ 50.00.